So, yesterday our flat was full of friends and really crap pop music on the telly. It was the Eurovision song contest and my Black Heart Stout went over well, I think. (I didn’t have the forethought to line up an international range of beers, as suggested by Mark at Pencil and Spoon.) I figured a really camp evening involving drinking games and bizarre pop acts in the name of European harmony (oh, and Israel) would be a good environment to debut my stout. Initially J said, “I’ve had worse.” I took it on the chin and stuck several brew dog beers in the fridge to chill as back up. But then when E tried it, she kept sipping saying it reminded her of Christmas. As the night wore on I noticed that for those drinking beer, well, it was the beer they were drinking. (Save one person who couldn’t be disuaded from Fosters in cans). J later said, “the bubbles are very tiny.” I don’t know if this is good or bad in a drinking-game beer, and I didn’t press it. Every time a contortionist showed up, or pyrotechics were used, cleavage heaved or gazes lingered on the camera too long, we drank my stout. And it was good enough. Have you noticed the 80’s are back? This isn’t really news–neon tube dresses and big bangs are never really news. Some even report the 90’s are back also, in a kind of apocalyptic pile-up of decades. The contemporary teen version of the 80’s is something much shinier than what the teens of the 80’s actually lived with, as if they are willfully embodying nostalgia for a time they never knew. If the 90’s come back, what will the zeitgeist polish up for us? If I was going to bring back the 90’s beer wise, it would be dishonest not to include Oranjeboom, a beer I drank a lot of–in cans–in Southern California. I don’t know if it was because it was, to us, exotic, Euro-trashy, and had this name we liked to say. 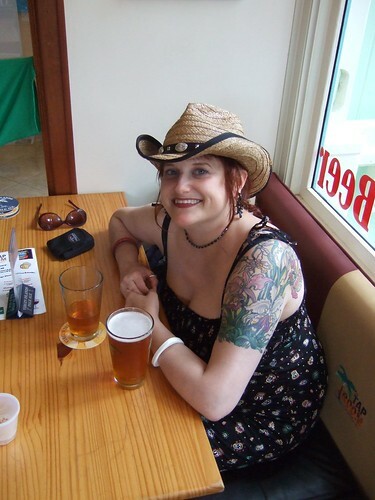 Before I knew anything about beer, it was cheap and easy. Yesterday I met up with a lovely Scouser friend, G, for beer and shoe shopping. He was gracious enough to ask me to suggest a beer to him. We were in a Shepherd’s Neame pub Mabel’s Tavern, and I haven’t had many of their beers because I’ve been put off by the ad campaigns. I ordered a Bishop’s Finger for G and a Kent’s Best for me– this beer was a winner, with a dominant, piny hop character and an enveloping malt, and he preferred his beer to mine. So then, on our second round, why do I decide to throw out all my beer know-how and order us two halves of crap lager? I’d never seen Oranjeboom outside of Trader Joe’s in SoCal. The little red tree–the happy name–I gave in to nostalgia. So much for being a beer expert! The beer was a forgettable, too-sweet lager. Apparently it is now brewed by Shepherd Neame, and is one of those rare beers that was probably better in the can! According to my friend, Oranjeboom’s big British moment was in the 80’s– maybe it’s right at home with the gladiator sandals and splatter prints on the high street. G regaled me with stories about the British marketing campaign in the 80’s which included Oranjeboom’s own version of the Bud Girl and he even sang me the jingle. And he drank it without complaint. What are friends for, after all? What are your ‘retro beers’? What beer, when confronted with a tap of it, would have an irresistably surreal nostalgia for you? What’s the perfect snorkel beer? 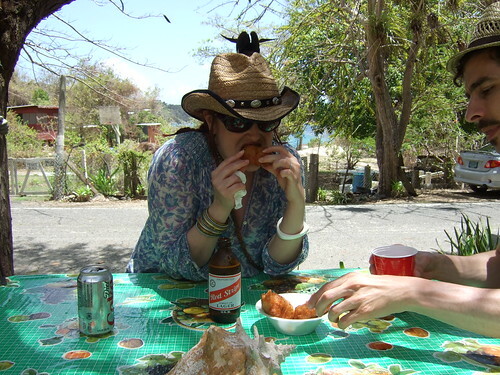 Conch fritters and Red Stripe at Vie's Shack on St. John. A lot of beer connoisseurs resort to local lager in the holiday heat. It’s true things we value in good beer can’t really be tasted if the beer is served cold, so if you are overheating why not drink something like a super-chilled, crap lager? Is this what’s known as a “lawnmower beer”? Having never had a lawn to mow, these beers seemed exotic, but after sweating off sunscreen while hiking and swimming for a week, I think I get it. What would be my “Snorkel Beer”? For most of my holiday in the Virgin Islands last week, I drank Red Stripe. I confess I have a weakness for the stuff. I love how the little squat bottle feels in the hand, the simple screen-painted label is perfect branding. Plus, I like the sweet malty character and it went perfectly with things I was eating like conch fritters, fried plantains and red beans and rice. But, luckily enough, my drink of choice wasn’t reduced to rum cocktails and Red Stripe, as there is a microbrewery on the island, St. John Brewery. It was located in a charming villa of shops called Mongoose Junction (the island seemed totally overrun with rikki-tikki-tavis). 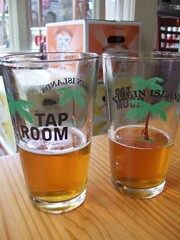 The Tap Room of the brewery had some beers from other east-coast micros on, and two of its own seasonal beers, the Tropical Mango Pale Ale and the Island Summer Ale. As far as names go these are pretty unimaginative, and I had my sights set rather low. Mr. Malting had the Island Summer Ale, which was too malty-sweet for me but he loved it. I then tried the Mango Ale, worrying it might be even sweeter, but I was pleasantly surprised. There was mango, but it was mainly a sweetness from the malt, totally cut with a dominant, grapefruity hop. This wasn’t really a fruit beer at all, any estery-earthiness reminiscent of mango came from something other than fruit, though according to their website this beer contains “essence of mango.” (Hey, the sun’s out, I’ve been swimming with garish, gregarious fish and I have the Caribbean sea soaked into me; does it really matter what “mango essence” is?) In the dense heat this beer became addictive and brought on a buzz happy enough to buffer any and all Jimmy-Buffet-Bob-Marley saturation (the Muzak of the Islands). The brewery’s story began in 2001 with two castaway college grads and a $50 brewing kit. They decided the island didn’t have the kind of beer they wanted to drink so they made their own. Their response seems perfect to the place, the “demands” of the islands, the sabor. The mango ale would have been great with saltfish, johnny cake or West Indian curry. In short it tasted of the genus loci of the island, something only a good microbrewery could capture. Gypsy Rose Lee serving the "Little Brekkie" on the far right. Without getting all pedantic, what exactly counts as a “cocktail”– must it be another liquid added? Another alcohol? If you add fruit (or, say, garlic) does it count? And, is it still real ale if you’ve doctored it with Tango? I must confess that though my mild has vastly improved with more time in the bottle, it’s just not very alcoholic. I’ve taken to dropping a shot of whisky into each pint and it’s a winner. I did not drink it from a martini glass a la Janet on Two Pints of Lager. That would have been ace. I would like to call this cocktail FREAKOUT IN A MOONSHINE DAYDREAM (oh yeah). And now it will have to be one of those mythic drinks that people whisper about in hushed tones like Westvleteren 13, because it’s all drunk up. With the success of FOAMeD, I feel I should branch out into other beer mixology. The Power Skunk: Pacifico, Emergen-C (any flavor will do but acai berry is the best) and a shot of vodka. If you find yourself in the Netherlands or other permissive environs, feel free to garnish with a fresh cannabis leaf. Little Brekkie: Bud, clamato and minced Vicodin. Three Wise Men and the Landlord: Goldschlager, Jagermeister, peppermint schnapps and some poorly-kept Timothy Taylor Landlord. Green Flem ahem. Or, the Flaming White Fairy: Hoegaarden and absinthe. Don’t forget to set the sugar cube on fire before pouring. *Sung to the tune of Hey Jude. **let it be known that I would consider drinking any and all of these, though for the record I would only drink the “Little Brekkie” when recovering from major surgery or other situations which would find me in legal possesion of controlled substances.